Both structural steel and facade installation is now complete at the Memorial Pavilion. Concrete core poured up to floor B1. The World Trade Center was destroyed in the September 11th terrorist attacks. Two commercial jet planes struck the Twin Towers, causing their collapse and the destruction of four other WTC buildings. The attack killed 2,750 people at the Trade Center, many of them emergency responders. The collapse of 7 WTC, which had already been evacuated, followed at 5:20 p.m. that day due to a fire in the building. Soon after the attacks, Larry Silverstein announced his intent to rebuild. The Lower Manhattan Development Corporation was created in the aftermath of September 11th by then-Governor George Pataki and then-Mayor Rudy Giuliani to plan the reconstruction of Lower Manhattan and distribute nearly $10 billion in federal funds aimed toward rebuilding and revitalizing downtown Manhattan. The LMDC sponsored the international design competition for the World Trade Center Memorial. LMDC works in coordination with public and private sectors to coordinate long-term planning for the World Trade Center site and the neighboring downtown communities. The LMDC selected Beyer Blinder Belle and Parsons Brinkerhoff to develop a master plan for the reconstruction and transportation planning of the WTC site. Beyer Blinder Belle is best known for its restoration of Grand Central Terminal while Parsons Brinkerhoff is one of the oldest U.S. private engineering firms involved in energy, environment and facilities engineering. The Federal Emergency Management issued a report on the collapse of 7 WTC on 9/11 based on a preliminary investigation conducted with the Structural Institute of the American Society of Civil Engineers confirming that the collapse was caused by fires on multiple stories ignited by debris from the other towers. These fires had continued due to lack of water for sprinklers or firefighting. The WTC recovery operation came to a ceremonial end, marking the completion of the removal of more than 1 million tons of concrete and steel. The 1st round of the design competition for the reconstruction of the World Trade Center site took place, known as the "Preliminary Design Contest". However, the designs submitted for rebuilding the WTC were criticized as being too boring and placing too much emphasis on office space. This round of the design competition sparked debate about the future of the World Trade Center site. New York Governor George Pataki and New Jersey Governor James McGreevey created a World Trade Center site viewing fence with heroes' names and other information panels for visitors. The first steel column was also erected at the WTC site for the temporary PATH station. The plans for the first major rebuilding project were announced by Larry Silverstein for 7 World Trade Center, a 52-story steel and glass skyscraper. Among its many building enhancements, 7 WTC included a reinforced concrete core and a steel superstructure. Safety systems exceeded New York City building code and are expected to form the model for future high-rise building codes. Construction on 7 WTC began soon after in 2002. The 2nd round of competition for the design contest, known as the "Innovative Design Contest" included Daniel Libeskind's scheme as a submittal. There were 2,000 entries in total. The seven semifinalists of this round of competition presented their designs at the Winter Garden of the World Financial Center. The Lower Manhattan Development Corporation and the Port Authority of New York and New Jersey chose the design by Daniel Libeskind of Berlin, Germany to replace the 16-acre World Trade Center site. Libeskind's design was judged based on 12 points of criteria including price, public response, vision, connectivity, public space, and how the victims of the September 11th attacks would be memorialized. 1 World Trade Center is already the most famous element of architect Daniel Libeskind's WTC Master Plan. Libeskind's plan proposed a descending spiral of towers beginning at the site's northwest corner and ending at the National 9/11 Memorial and Museum, where the Twin Towers' footprints will be memorialized. The Lower Manhattan Development Corporation announced the start of an international design competition for the WTC Memorial Site to commemorate those lost on September 11th and the 1993 bombings of the World Trade Center. Architect David Childs of Skidmore, Ownings & Merrill was selected to design 1 World Trade Center, planned to be the tallest of the five new WTC office towers. Mr. Childs is a graduate of Yale College and the Yale School of Art and Architecture. He joined the Washington, DC office of Skidmore, Owings & Merrill in 1971 after having served as the design director of the Pennsylvania Avenue Commission. David Childs then relocated to SOM's New York office where he worked on the New York Mercantile Exchange, the arrivals building at JFK, and Worldwide Plaza, among others. Differences of opinion quickly arose between Libeskind and Childs regarding their visions for the site's final result. Spanish architect Santiago Calatrava was selected by the Port Authority of New York & New Jersey to design the World Trade Center Transportation Hub. Calatrava is best known for his designs of public buildings and bridges. Some of his more recent work includes the Sundial at Turtle Bay in Redding, California, the James Joyce in Dublin, and the Olympic sports complex in Athens. A temporary PATH station opened. The station featured a canopy entrance along Church Street and a 118-by-12 foot mosaic mural, "Iridescent Lightning," by Giulio Candussio. The station was also ornamented with opaque panel walls inscribed with inspirational quotes attesting to the resilience of New York City. The panels partially shielded the WTC site from view. Since reopening after 9/11, the station has reclaimed its status as the busiest station in the PATH system. 1 World Trade Center plans were unveiled to the public. The shimmering skyscraper of glass, steel, and cable would stand at 1,776 feet, invoking the symbolism of the building. The building was designed to sit at the northwest corner of the site. The design also called for 70 commercial stories with 2.6 million square feet of office space, plus an underground regional transportation hub, garages, and several shopping centers. A public observation deck and a rebuilt Windows on the World, the restaurant that once sat atop the north tower was also in the plan. The previous World Trade Center buildings each had 110 stories, but 1 World Trace Center will rise higher because of a large glass structure and 276-foot spire topping off the building. Michael Arad and Peter Walker were selected as the designers of the Memorial ‘Reflecting Absence', honoring those lost in the terrorist attacks of September 11, 2001 and February 26, 1993. 5,201 submissions were received and the World Trade Center Memorial Competition, launched by the LMDC, became the largest design competition in history. Santiago Calatrava presented the design for the WTC Transportation Hub at the Winter Garden. The design evokes the image of a bird in flight. The building will be build with steel, glass, and light. To bring an even greater sense of open air and natural light to the station's concourse, mezzanine, and platform levels, Calatrava designed the hub's ceiling to retract-an innovative concept used mostly in sports arenas. Each level inside the station was designed to be column-free to create an open, bright space. Through this Transportation Hub, pedestrians will have access to Hudson River ferry terminals, PATH trains, 13 subway lines, and possibly a direct rail link to JFK International Airport. The Hub will be positioned at the northeast corner of the WTC site at Church and Vessey Streets and is expected to form an underground connection between the World Financial Center and the Metropolitan Transportation Authority's Fulton Street Transit Center. Honoring the "enduring spirit of freedom", Mayor Bloomberg laid the cornerstone of the Freedom Tower, a 20-ton piece of granite inscribed with those words. The ceremony also included remarks from Gov. McGreevey, musical performances by the Young People's Chorus of New York City, Metropolitan Opera singer Morris Robinson, and a reading from the Declaration of Independence by the 12-year-old son a Port Authority police officer killed on 9/11. The final design of the WTC Memorial and museum was unveiled by Arad and Walker. The design included two large "voids"-cascading reflecting pools thirty feet into the footprints of the Twin Towers. The design allowed visitors to follow ramps angled down the side of each footprint to an underground chamber that allows views. Names of all the victims, including rescuers and those who died in the 1993 Trade Center bombing are inscribed on a wall between the chamber and the pool. Extensive landscaping in the plaza featuring 400 swamp white oak and sweet gum trees will create a canopy over the plaza in the warmer months. 1 World Trade Center was redesigned due to security concerns by the NYPD and then-Governor George Pataki. Details such as the 1,776 height and the 276-foot spire remained the same. To comply with safety concerns, 1 World Trade Center would have no occupied space other than the lobby. It was also redesigned to be set back farther from West Street, a heavily trafficked highway. Many of the windows were planned to be tempered, laminated and multilayered for extra protection against explosions. The newly designed base has a smaller footprint and planned to be more of a square than a parallelogram. Construction on the World Trade Center Transportation Hub began. Designed by Santiago Calatrava, the PATH was intended to accommodate 250,000 pedestrians per day. One of the innovative features of the design is that natural light will reach 60 feet below street level. Silverstein Properties announced Lord Norman Foster to design Tower 2 at the World Trade Center. Workers began to remove remaining debris and started surveying work at the World Trade Center. This marked the start of construction on the National September 11 Memorial & Museum. The Port Authority of New York and New Jersey and Larry Silverstein reached an agreement in which Silverstein relinquished rights to develop the Freedom Tower and Tower 5 in exchange for financing with Liberty Bonds for Towers 2, 3, and 4. Adamson Associates of Toronto was selected as the Executive Architect to lead a team of architects that would eventually included Foster & Partners, Rogers Stirk Harbour + Partnership (RSHP) and Maki and Associates. Ground was broken for construction of 1 World Trade Center, the symbolic skyscraper designed to replace the destroyed World Trade Center. The tower will pay homage to the original twin towers, and will rise to 1,776 feet with its illuminated antenna. Just days after construction began on 1 World Trade Center, Larry Silverstein announced that architects Richard Rogers and Fumihiko Maki would each design high-rise office towers at the World Trade Center site. Rogers Stirk Harbour + Partnership (RSHP) designed Tower 3 Fumihiko Maki designed Tower 4. These architects joined an impressive roster of architectural stars working at the site including site master planner Daniel Libeskin; David Childs of SOM designing the Freedom Tower; Santiago Calatrava, the architect for the transit hub; Michael Arad, who with Peter Walker, is responsible for the World Trade Center Memorial and Museum, and Lord Norman Foster for Tower 2. Following the announcement, Silverstein Properties set up a WTC design studio at 7 World Trade Center with architects, engineers, and consultants working together in an unprecedented collaborative spirit on the designs for Towers 2, 3 and 4. June 29, 2006 David Childs of Skidmore, Owings & Merrill presented the final design for 1 World Trade Center. He unveiled several final drawings to an audience of 700 engineers and architects at the AIA New York Chapter's 2006 Design Awards held at 7 World Trade Center. The revised design for 1 World Trade Center featured a 186-foot-tall podium which was redesigned to be covered by a screen of glass prisms, veiling the concrete base that was originally criticized for being too brutalist. Production of the first steel was produced in Luxembourg to create the first 27 "extra-large" steel columns of 1 World Trade Center. Approximately 805 tons of steel was being produced to serve as part of the below-grade structure for the historic tower. Silverstein Properties unveiled designs for Towers 2, 3 and 4 by architects Norman Foster, Richard Rogers, and Fumihiko Maki, respectively, along with a complete master plan for the entire east bathtub. For Tower 2, Foster designed a 78-story skyscraper that peaks with a slanted diamond-shaped top, recognizing the memorial below. Rogers' 71-story Tower 3 featured a slim glass box enclosed in an exterior steel frame of diagonal braces. Maki introduced a 61-story minimalist tower constructed in glass lined with perforated metal, intended to create a unique luster. A fifth office tower on Liberty Street, the Santiago Calatrava-designed WTC Transportation Hub, performing arts center, memorial and museum will complete the vision for the site. Moody's Corporation signed a 20-year lease to occupy 15 floors of the 52-story 7 World Trade Center. At approximately 600,000 square feet on 15 floors, beginning with the 12th floor, the Moody's lease is the largest to date at the World Trade Center and the largest lease transaction in Manhattan in 2006. The entire Silverstein Properties team was given the go ahead to proceed with the design and construction of the East Bathtub. 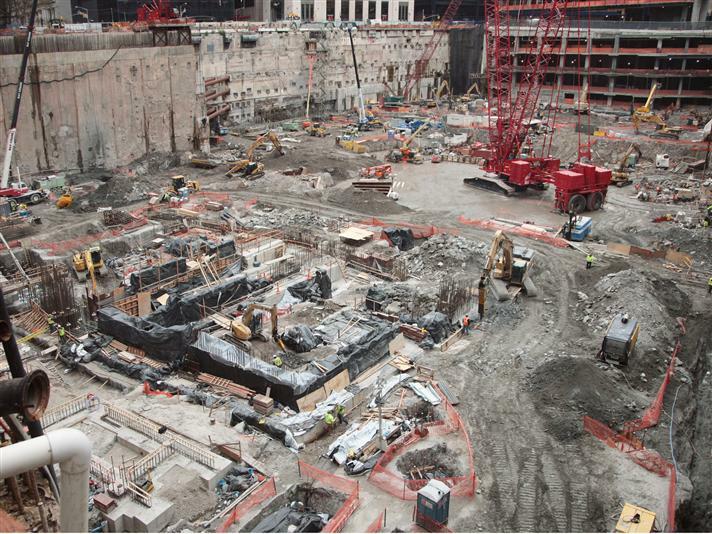 2006 marked the start of heavy foundation construction for the east bathtub, the installation of 1 World Trade Center's first steel, and the construction of the memorial's footings. Governor George E. Pataki, Mayor Michael R. Bloomberg and Port Authority officials gathered to witness the placement of the first steel columns for 1 World Trade Center. The Board of Commissioners authorized The Port Authority to enter into a long-term sub-net lease with JPMorgan Chase & Co. to develop Tower 5 as a 1.3 million-square-foot skyscraper at The World Trade Center site. WTC officials and architects joined Silverstein Properties to unveil final designs and construction plans for Tower 2, 3, and 4. Refinements to the plan included orienting the office lobbies westward, access to lower-level retail and the WTC Transportation Hub, and earning LEED gold certification. The three Greenwich Street Towers were planned to be models of life safety, cutting edge technology, and examples of environmental efficiency. The Port Authority began turning over the southern portion of the East Bathtub to Silverstein Properties, allowing foundation work to begin for Tower 3 (175 Greenwich Street) and Tower 4 (150 Greenwich Street). Designs for WTC Towers 2, 3 and 4 were completed. Mayor Michael Bloomberg and Larry Silverstein announce that West LB, a leading German financial institute, leased the top three floors of 7 World Trade Center, bringing the building's total occupancy to 85%. 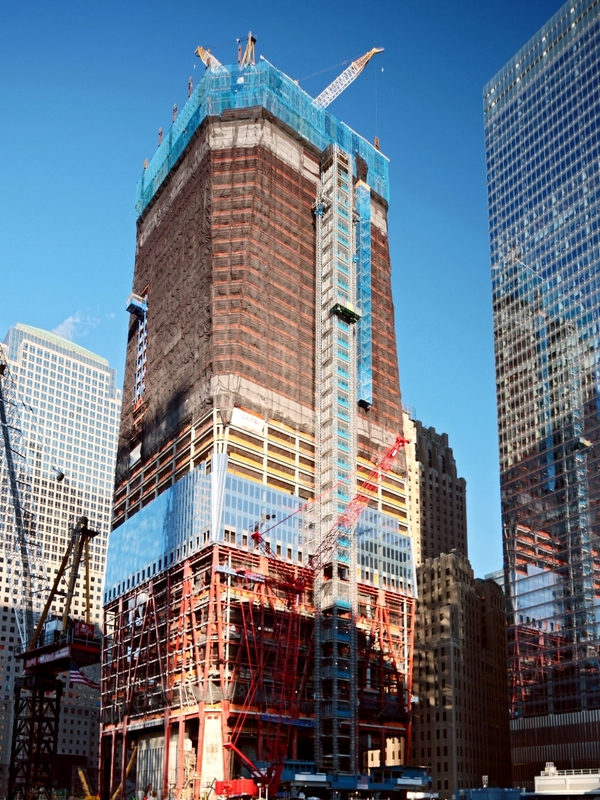 Construction on World Trade Center Tower 4 is well underway. Tower 4 was designed by Japanese architect Fumihiko Maki. Maki's minimalist vision for this 64-story tower complements Daniel Libeskind's master plan, which uses the four WTC towers as an abstract spiral descending towards the National 9/11 Memorial. At 975 feet, Tower 4 is the shortest of the east-side towers, distinctive for its sleek, glass façade and two distinctly shaped floor plates. The Port Authority of New York and New Jersey changed the name of the Freedom Tower to 1 World Trade Center with the rationale that this would make the building more marketable for tenants and the public. The Port Authority of New York and New Jersey announced that they wanted to cancel construction on Tower 5 altogether to cut the amount of office space available in the reconstructed World Trade Center to 5 million square feet. Mayor Michael Bloomberg invited leaders including Assembly Speaker Sheldon Silver, New Jersey Governor Jon Corzine, Governor David Patterson, Silverstein Properties and Port Authority officials to Gracie Mansion to discuss the future of the site and ended with a promise of another meeting. This meeting marked another step forward in the rebuilding process of the WTC. After a three-month long hearing, an arbitration panel ruled to give the Port Authority of New York and New Jersey and Silverstien Properites 45 days to come up with a new development schedule for the Towers 2, 3 and 4. 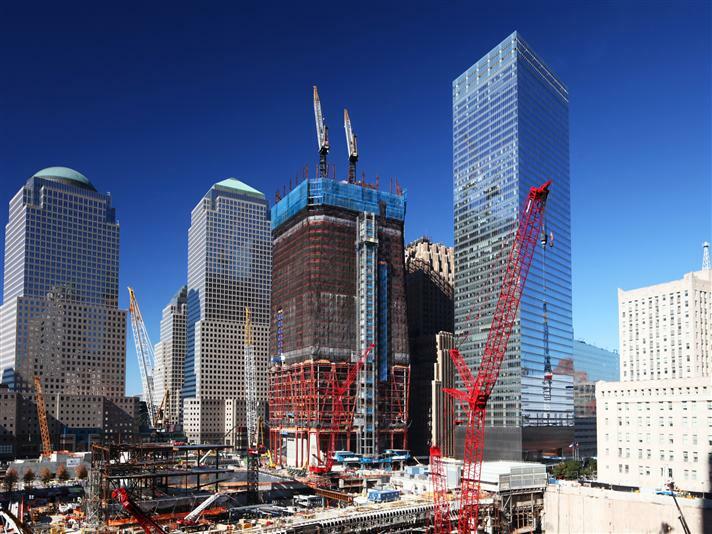 The States of New York and New Jersey, the City of New York, the Port Authority and Silverstein Properties announced the outline of a development plan for the east side of the World Trade Center site. The plan calls for the immediate restoration of the east side of the WTC site to at least street level, the completion of Tower 4 by 2013, possible completion of Tower 3 by 2015, and the phase-in of Tower 2 over time. 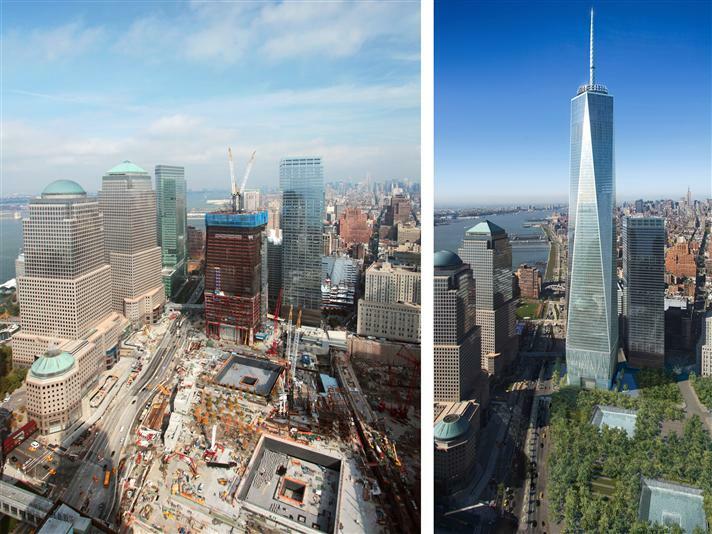 Other projects at the site, including the 9/11 Memorial, One World Trade Center, the WTC Transportation Hub and other public infrastructure, will continue moving forward. Negotiations were extended for 120 days for both sides to continue discussion and the new agreement is expected to be signed in the summer of 2010. Foundation work begins for World Trade Center Towers 2 and 3 marking the first time every part of the site is under construction.